The current recycling laws, colloquially known as the Pfandsystem, came into force in 2003 and were modified again 3 years later. They regulate the sale and return of plastic and glass bottles, as well as aluminium cans. The German Pfand system was brought into force to ensure that there was a responsible policy in place for the recycling of plastic bottles. It came into being to encourage drinks companies to supply their product in multi-use, refillable plastic or glass bottles. These can be refilled up to 25 times for the plastic variety and up to 50 times for glass. In doing so, this reduces the average CO2 emissions per bottle in circulation because fewer new bottles have to be manufactured. The process of washing and sterilising existing bottles is overwhelmingly more environmentally friendly in terms of CO2 output than the production of new, single-use bottles. 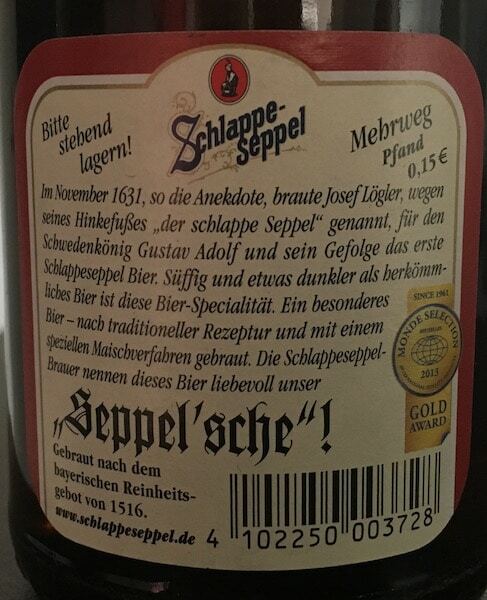 According to a recent Spiegel article, at the time the law came into force, 64% of all bottles purchased were refilled i.e. were multi-use bottles. At the end of 2012, this had reduced to 46%, with the trend heading downwards. In early 2015, Coca Cola announced that it would over time phase out multi-use bottles in favour of one-time use, citing the high logistics costs of collecting the multi-use bottles and holding free storage space for them. 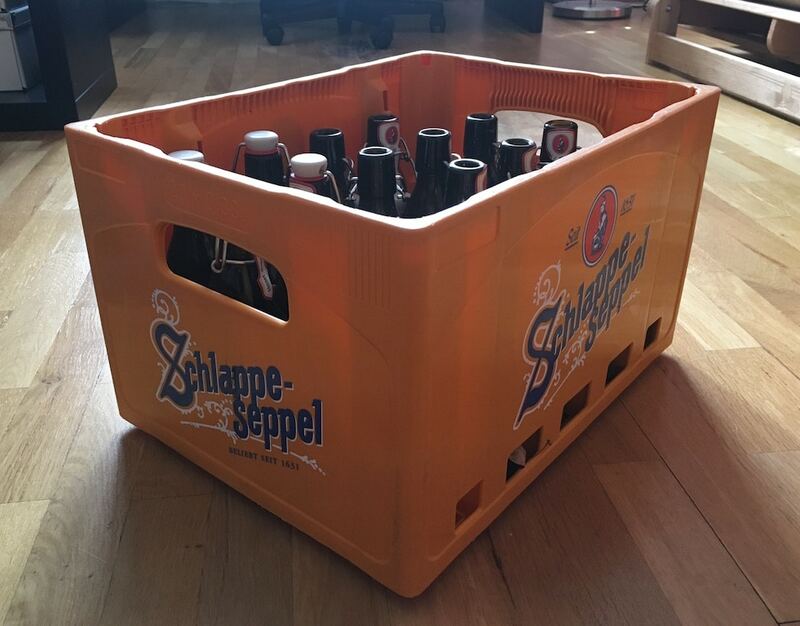 Beer crates usually come in 20 x 0.5l or 24 x 0.33l, like the one pictured. These bottles also have the flip-top “Bügel” which carries a higher Pfand. Essentially, the German Pfand system is a cycle. The drinks manufacturer fills his product, for example, beer or water, into these bottles. These bottles are sold to wholesalers or retailers. The wholesaler or retailer pays a deposit to the producer. This deposit is then passed on directly to the customer in the form of a surcharge. In the case of wholesalers, there is an extra step in the chain as he passes this on to individual retailers such as your local kiosk. As end customers, we then pay this deposit, or Pfand, to the supermarket, kiosk, Getränkemarkt or whoever and we get it back when we return the bottles. Glass beer bottles of 0.33 or 0.5 litre of have a deposit of 8 cents. Glass water bottles of 0.75 or 1 litre have a deposit of 15 cents. Plastic multi-use bottles in all shapes have a deposit of 15 cents. There are also single-use bottles, or Einwegflaschen as they are known in German. These you probably know best as your cheap 6-pack of 1.5 litre mineral water bottles from your local supermarket. Other examples are also common though. In many discounters, Coca Cola and Pepsi sell their products in 0.5 litre or 1.25 litre bottles which are single-use. Single-use bottles by law carry a higher deposit, meaning that a 25 cent deposit is levied on the sale of these bottles. The logic for this is that the higher deposit should act as a disincentive. Drinks cans also carry a 25 cent deposit too and are treated in the same way i.e. as single-use products. So far, so good. But here is where they made a real dog's dinner of the German Pfand system legislation. Why do some places refuse to accept my empties? You see, a store's obligation to accept empties depends on what type of empties they are. Or specifically, whether they are single-use or multi-use bottles. Single-use bottles are regulated by law and everybody who sells them must accept the return of empties. Go to your local supermarket and you'll find that the automated machines which accept the returned bottles will take 99% of what you throw in there, provided it's a bottle with a valid German Pfand label and barcode on it. Exceptions could be bottles (or cans) which you may have purchased in a Turkish (or any other specialist foreign foods) supermarket, as some of their product is imported from wholesalers abroad and thus not subjected to German legislation on deposits. These few exceptions aside however, generally speaking, unless the label is illegible, these machines will accept what you put in there as long as they are Einwegflaschen. You can easily tell this by looking at the label to see if it contains the description PET. Now, what happens with Mehrwegflaschen is different. There is no obligation on the part of the drinks trader or supermarket to take these back if they are not brands which are sold by that particular outlet. Anything other than returning the empties to the place where you purchased them from, with a valid receipt, is based on goodwill from the party you are returning them to. In reality, most major Getränkemarkt chains will accept more or less anything back because they are big enough and have relationships with pretty much all drinks producers nationwide, even if not locally. There are one or two exceptions: They will not accept foreign bottles or crates, even if the shape and form is identical to those you bought in Germany. Case in point, I bought 3 crates of wonderful Primátor beer back from Czechia and still have the crates stuck in my cellar because nobody will take them. Certain types of promo non-standard sized bottles may also cause you issues. Is there a deposit on all plastic and glass? Erm, no. This is another anomaly where the law is inconsistent. Juice, milk, wine and spirits sold in glass or plastic bottles are not subjected to legally enforceable deposits. There are also no deposits on plastic or glass packaging of foodstuffs, for example cooking and condiment sauces. Paper-based drinks cartons are also excluded from the law, even though they are usually coated in plastic. In a nutshell, the law does not tip the scales enough in favour of incentivising the use of multi-use bottles. If you can return Einwegflaschen anywhere, but you have to think and plan where you take your Mehrwegs back to, is it really a surprise that consumers are turning their back on the environmentally friendly option? The price difference of 10 cents between single and multi-use bottles is peanuts, and does not incentivise the consumer into doing what is right for the environment in terms of his shopping habits. Furthermore, the Pfand law has generated a very lucrative business for retailers. 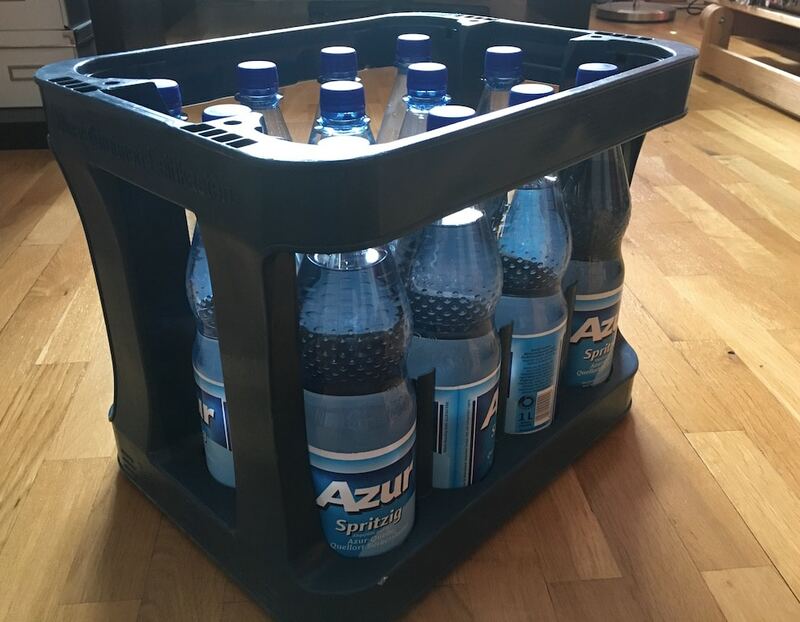 Generally, people are more likely to return multi-use bottles because often they are sold in crates, and carry the whopping €3.00+ crate deposit on them (the exact amount depends on the type of product) which makes it worth your while to return. Single-use bottles, on the other hand, are always sold either loose or plastic wrapped as 6-packs. Who profits from this? The retailer. Every time you buy a bottle of water in a single-use bottle and throw the bottle away, the seller has made an additional 25 cents profit from you. The likelihood of that bottle making its way back to that specific retailer is slim. One conseqeuence of the law is that smaller, regional producers, for example of water and fizzy soft drinks, are inherently disadvantaged because they have remained on the path of supplying in mutli-use bottles. They don't have multi-million Euro contracts with Aldi and Lidl that the likes of Coca Cola and Pepsi do, and rely heavily on the Getränkemarkt wholesalers for their business, most of whom deal in multi-use bottled product. Is it a good system? Firstly, I would make any bottles sold at train stations, street festivals and places where people can't conveniently just go and give back their empties pfandfrei. The current system is daylight robbery and it lines the pockets of retailers in such places, if they are making 15 or 25 cents additional margin on every soft drinks bottle they sell. Secondly, I would make all retail outlets larger than a sole-trading kiosk or small general store sell only Mehrwegflaschen, as an acknowledgement to the environmental concerns of one-way plastic bottles and to drive home the original reason to implement such a law in the first place. The likes of Aldi, Lidl, Coca Cola and Pepsi must be coerced into doing what the law intended it to do. Clearly they are not acting in an environmentally friendly way, so the Pfand system must be designed in such a way to force their hand. If smaller, regional drinks companies are acting responsibly, and in doing so they are being disadvantaged, clearly this is not “perfect competition” as an economist would understand it to be. Finally, every single outlet which sells drinks in Mehrwegflaschen MUST be legally obliged to accept EVERY SINGLE brand and bottle shape and give back deposits on them. If you sell this stuff then must take all of it back, regardless of where it was purchased. It confuses the hell out of people why certain places don't pay Pfand on certain bottles. It's an inconvenience, and it turns customers off buying them. The environmental gain of recycling is rubbished if you have to drive back to the place you purchased the stuff from with the vehicle emissions that would entail. Retailers make a FORTUNE from customers buying Pfandflaschen and not returning them. They can, and must, absorb the inconvenience of accepting other outlets' bottles. What goes around comes around. People had this down to a science as we made our way toward the arena for a Bundesliga match. Reusable plastic bags & shopping carts were positioned all over to collect fans’ & revellers’ empty bottles. Haha, so much fun reading this article. Someone clearly did not do his homework very carefully or has never been to Germany using the system. Sad. I m a producer of drinks based in France. My soda is in 1 liter plastic bottle. Wine 75 cl glass bottle. I will soon start to export drinks. So, do I have to extra charge my German supermarkets clients for ´Pfand’ on each bottle ? Honestly, for the plastic bottles I don’t know because I am not a lawyer and have never sold drinks to German wholesalers. If you want an answer without having to pay a lawyer, I would suggest you approach a couple of major German drinks distributors / wholesalers to ask how it works with EU imports. I know for sure that wine in glass bottles is not subject to the Pfand law. check on this website. Explains (barely) the pfand system and the clearing process (no retailer is keeping extra money from the pfand). I don’t normally respond to articles but I feel I must react to this interesting piece. I really found the article informative and useful but I feel it would have been useful to have included the fact that long before the act in 2003 Germany had a strong tradition of Pfand on bottles. When I worked in Germany in 1978 I was taken by the fact that you could go to the supermarket and purchase your beer in crates. What impressed me was that when you had drunk the beer you returned the crate and empty bottles, received your Pfand back on both and then reapplied it to your next crate of beer. In principle you were only paying for the fresh beer. I have been banging on about the system ever since. 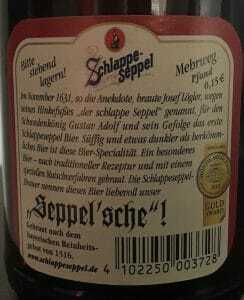 The introduction of Pfand on plastic bottles and cans merely reinforced my feeling that Germany was on the right track. With our government in the UK currently looking to introduce a Pfand system I hope they don’t exclude the idea of multi-use bottles. Of course there will be resistance from industry to any sort of law that requires them to handle returns but you make the point well that all those bottles that are still not returned in Germany represent a profit for the companies. Here in the U.K. the public are happy to comply to recycling/environmental initiatives as the plastic bag charge has proven. There is currently a strong move back to glass milk bottles. One should not forget that only a generation ago in the UK we had a working system of deposits on glass bottles for beer and soft drinks. This encouraged young children to return them with the promise of a bar of chocolate funded by the return Pfand. Happy Days! Yes, in principle it is a great system and I hope for one that the UK follows suit but manages to iron out the faults which are apparent in the German system. For example, it is highly annoying that drinks distributors do not have to take all recyclable bottles, only those brands which they sell themselves. Meaning the inconvenience is forced onto the consumer rather than the retailer. Which is one reason why people more and more buy “Einweg” plastic bottles – because the return vending machines for these take every conceivable bottle, as long as it contains a German barcode.